A bend in the Colorado River, above State Bridge. Each year, 74 percent of the upper Colorado, as measured at Hot Sulpher Springs, flows east, not west. 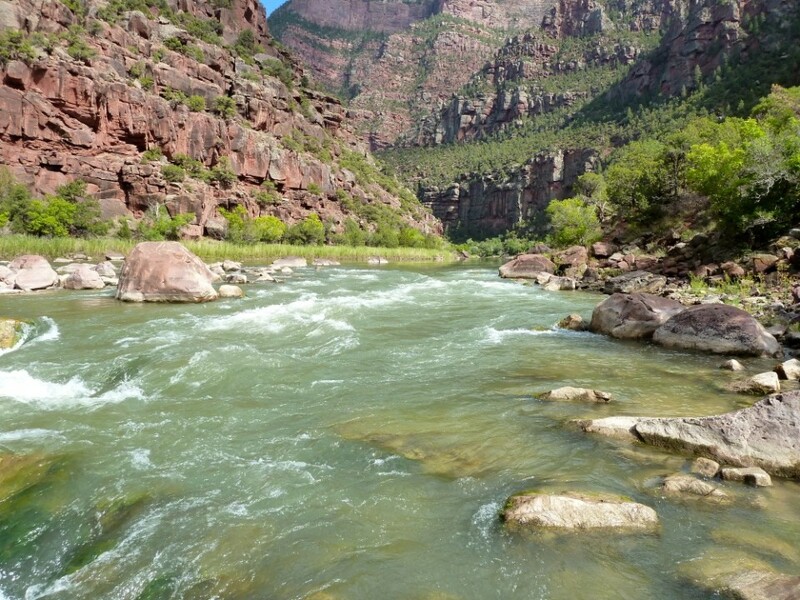 GLENWOOD SPRINGS — The members of the Colorado River Basin Roundtable last week unanimously agreed to tell a group of Front Range water interests not to look for new sources of water on the Western Slope to meet a forecasted water shortage. “Don’t goddamn come here any more,” was the way Lurline Curran, county manager of Grand County, summed up the roundtable’s position just before the group voted to approve a white paper it has been working on for months. The actual paper crafted by the Colorado roundtable states its case in a more diplomatic fashion, but it is still blunt. 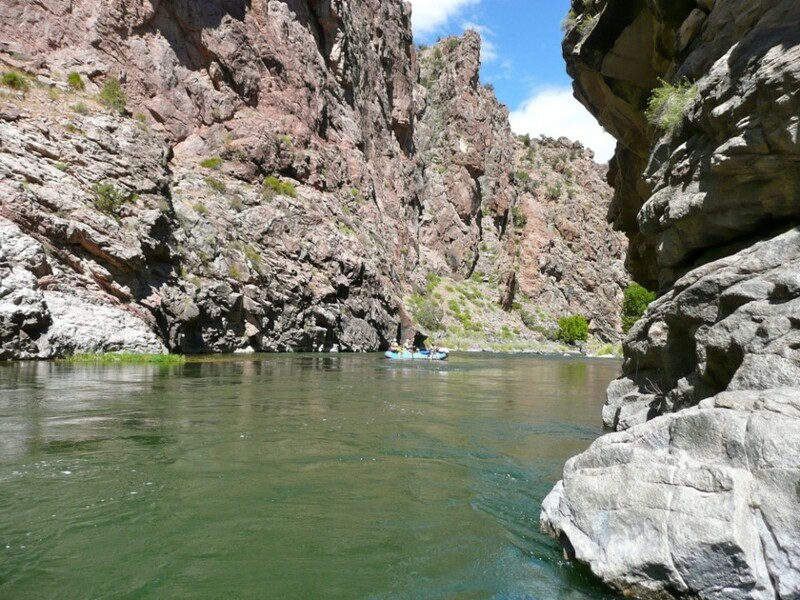 “The notion that increasing demands on the Front Range can always be met with a new supply from the Colorado River, or any other river, (is) no longer valid,” the position paper states. The Colorado roundtable is one of nine roundtables established by the state Legislature eight years ago. It holds monthly meetings in Glenwood Springs and has 37 members representing various interests, including agriculture, water utilities, environmental concerns, recreational users, and federal and state agencies. And the roundtable members in attendance last Monday voted to send their white paper to the Interbasin Compact Committee, which serves as a state-level coordinating committee for the roundtables and is also studying how to best to meet a projected “supply gap” of 500,000 acre-feet in 2050. To date, the Committee has not articulated its own vision for “new supply” and the roundtables are seeking to influence the committee’s analysis and findings. “There is going to have to be a discussion and plan for developing a new West Slope water supply,” the South Platte roundtable stated in a June memo directed to the Committee. Together, the South Platte, Metro and Arkansas roundtables are pushing that discussion. 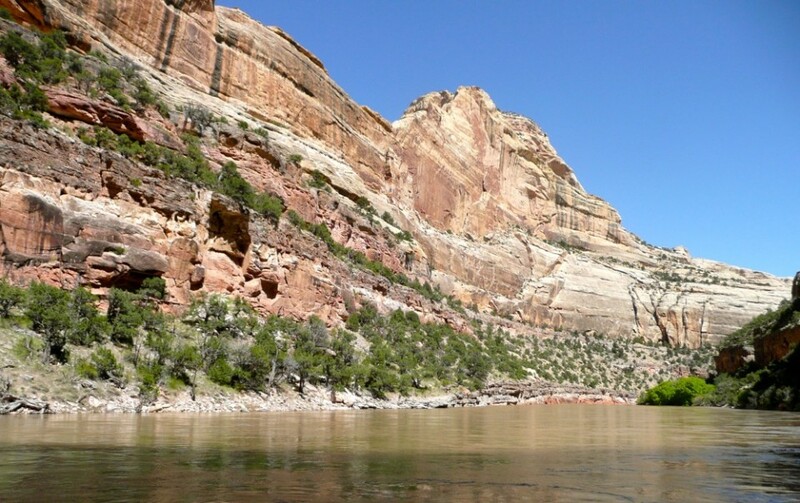 They’re asking the state to preserve the option to build “several” 100,000 to 250,000 acre-foot projects on the Green River at Flaming Gorge Reservoir, the lower Yampa River, and/or the Gunnison River at Blue Mesa Reservoir. Currently, the Front Range diverts between 450,000 to 600,000 acre-feet each year from the Western Slope. At the upper end, that’s the equivalent of six Ruedi Reservoirs worth of water each year. Which, from the point of view of the Colorado roundtable, is enough already. “There will be no further degradation or diminishment of West Slope stream and river ecosystems or recreational opportunity,” the roundtable’s paper says. On Nov. 25, the members of the Colorado roundtable clearly wanted to inform the Interbasin Compact Committee that they don’t support the idea of new Western Slope projects. The Committee’s eventual analysis is expected to shape a draft statewide Colorado Water Plan, which is supposed to be on the governor’s desk via the Committee and the Colorado Water Conservation Board in 12 months. And while there has been a decades-long discussion in Colorado about the merits of moving water from the Western Slope to the Front Range, the language in the position papers, and the roundtable meetings, is getting sharper as the state water plan now takes shape. “It’s not ‘don’t take one more drop,’ but it is as close as we can get,” said Ken Neubecker, the environmental representative on the Colorado roundtable, about the group’s current position. But the Committee meets next on Dec. 4 in Golden and “new supply” is on the agenda. “This option must be the last option,” the paper notes. Instead of new expensive Western Slope water projects, the paper calls for more water conservation and “intelligent land use” on the Front Range. It goes on to note that Front Range interests are actively pursuing the expansion of existing transmountain diversions — many of which are likely to be blessed by the Committee because they are already in the works. It says the Western Slope has its own water gap, as the growing demands of agriculture, energy development, population growth and river ecosystems are coming together in the face of climate change. It calls for reform to the state’s water laws, so it is easier to leave water in Western Slope rivers for environmental reasons, and it rejects the Front Range’s call to streamline the review process for new water projects. “Streamlining as a means of forcing West Slope acquiescence to any new supply project ‘for the good of the state’ is unacceptable,” the paper states. 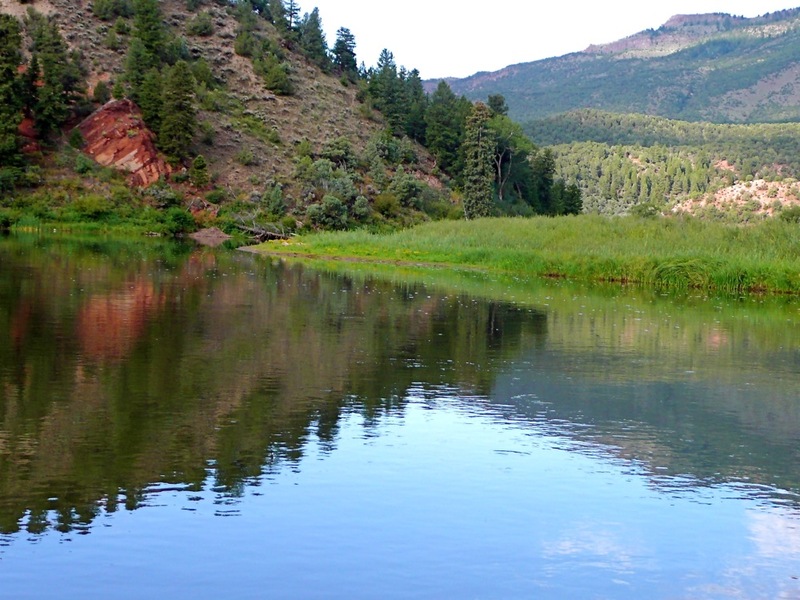 The Colorado River roundtable is not alone in sending a “back-off” message to the Committee. In a Sept. 14 letter, the chair of the Gunnison River Basin Roundtable, Michelle Pierce, told the chair of the Committee that “although I know that some are eager to move forward with plans to develop additional water from the Colorado River, significant doubt remains regarding whether or not there is any additional water available for such development. “Recent discussions regarding the Gunnison’s implementation plan have made it clear that there may not be enough water available in the Colorado River system to meet the relatively meager gaps that exist on the Western Slope, much less the considerably larger gaps that exist on the Eastern Slope,” Pierce wrote. Referenced in the Colorado roundtable white paper, are a set of “Western Slope Principles” developed jointly by the Western Slope roundtables. They’ve been endorsed by Pitkin, Eagle, Gunnison, Summit and Park counties, along with the towns of Breckenridge, Frisco, Silverthorne, Dillon, Grand Lake, Crested Butte and Gypsum. However, the Front Range roundtables point out that they have already effectively increased conservation and reuse efforts, and even with future statewide regulations on water-saving fixtures and appliances, costly investments in water systems and changes to make irrigation more efficient, they still won’t meet forecasted demand. “Regardless of the water-conservation strategy that is achieved, additional water supply will be needed to meet the 2050 projected water demand,” according to a recent update from the Metro roundtable on conservation strategies. As the Front Range roundtables see it, the options are pretty much either to dry up Front Range agriculture or divert more water from the Western Slope. “The scenario planning exercises show that a large amount of east slope agricultural water or additional Colorado River water could be needed in the next 30 to 40 years to fill the east slope municipal supply gap,” says the July joint statement from the South Platte, Metro and Arkansas roundtables. Jacob Bornstein, a program manager in the water supply division of the Colorado Water Conservation Board, acknowledged Monday that discussions at the regional roundtables were growing more intense, and further apart. “We already know there is going to be a difference of opinion,” he said. Editor’s note: This story was done in collaboration with The Aspen Times, which published it on Monday, Dec. 2, 2013.